‘The year of the ICO’, or 2017 to everyone else, saw the ICO market grow from a mere $15 million dollars raised in January to an incredible $1 billion in December. The returns were insane, the scams were plentiful, and many had nothing more to show than an edgy website and a dodgy whitepaper. However, all this attention has not gone unnoticed, and the market has quickly evolved past the simple public crowdsale funding model. This all began sometime during 2017 when smart marketing teams realised they could take advantage of the insatiable demand for tokens with a new type of funding: The Pre-Sale. A pre-sale is a period before the public ICO that rewards early investor support with bonus tokens, typically 10-30% depending on the volume of money put in. Investors get more tokens for their buck, projects get funded easier, everyone wins. Apart from those who don’t make it into the pre-sale. As limiting those who could participate and get bonuses resulted in unmet demand, which generated hype and led to public ICOs selling out way faster. Whether this was done intentionally or was a consequence of scarcity remains unclear, but it set the whole ICO market on a new course. As demand for ICOs continued to grow, so did the complexity of token sales. The next stage in the evolution was the creation of Seed Rounds, intended to fund initial development and marketing efforts. These early investors were rewarded for taking big risks with ridiculous bonuses, anywhere from 100-500%. However, it wasn’t just the ICO market that was exploding, as mid December saw the total market cap reach an all time high of $650 billion. The cryptocurrency scene was attracting a hell of a lot of media attention, but they weren’t the only ones watching. Regulators and traditional VCs were beginning to take note and they all wanted a piece of the pie. 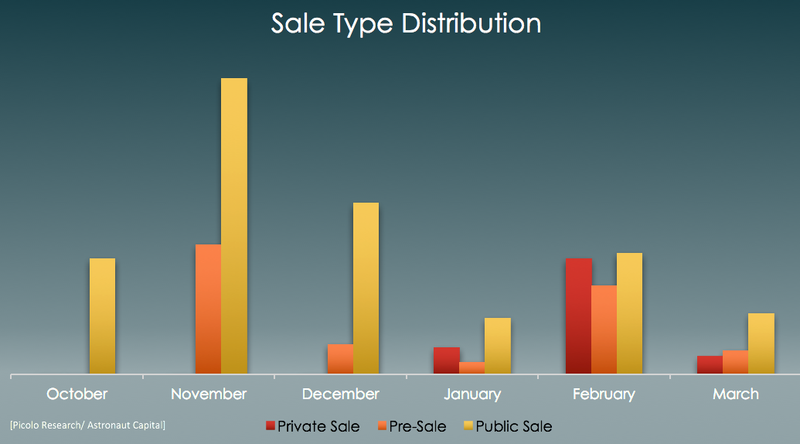 Which brings us to the final stage in the evolution thus far: The Private Sale. This stage is the most similar to a traditional funding round that many startups undergo, targeting VCs, wealthy individuals and investment funds. In an attempt to abide by regulations, only accredited investors are accepted and are often required to sign a new ICO contract called a SAFT agreement. They are also usually required to commit to a token lockup. If 2017 was the year of the ICO, then 2018 is the year of the private sale. Already this year there has been more than double the number of ICOs held in 2017, with a total value more than 3x as high at roughly $10.5 billion. However, the percentage of funding allocation is shifting fast and is now heavily made up of private and pre-sale investors. But why might this be? Well, from a fledgling projects perspective, there are many benefits to acquiring all of your funding from a private sale. Firstly, it helps mitigate legal risks by following proper investment procedures. Secondly, it costs far less and is a lot less effort. How much easier is it to market your product to 5-10 investors than to 10,000? Lastly, VCs and the like are less likely to dump tokens as soon as they hit an exchange – which can massively devalue a project. Recently, we have seen a number of high profile projects ‘cancelling’ their public sale because they were able to easily find funding via the private route. For example, Dfinity and VideoCoin. However, to ensure a ‘wide and fair’ distribution of tokens, many are opting for community airdrops. Join Telegram groups of any projects you are interested in. Subscribe to email lists for projects of interest. Engage with the community by taking part in testnets, bug bounties etc. Restricting ICO access to average investors has also led many to turn to ICO pools- a group where many small investors pool funds together in order to gain bargaining power and negotiate deals with ICOs. However, many of these groups are pretty shady and because they use Primablock for pooling funds, which is not trustless, there are many scams. We would not recommend using an ICO pool until a trustless pooling service is developed. What About the Market as a Whole? Reduced Adoption – Adoption is widely accepted to be one of the biggest hurdles for cryptocurrencies. Running a public ICO means people will go out and learn about a project, niche sites will review the ICO, bloggers may write about it on Steemit, Medium and HackerNoon. It is undoubtedly the best way to market the project to as many personally invested people as possible. They want to see the project succeed in order to get a good ROI, so engage with the project and become actual users of the network. Investors Dump Airdropped Tokens. It is well known that when the community get given tokens for free they often dump them on exchanges, so it could have the opposite of the desired effect if the airdrop amount is significant. Goes Against Crypto Principles. One of the core founding values of cryptocurrencies is to put ordinary people back in control of their finances and restore equality. Closing off ICOs to investors unless they are accredited i.e. have a net worth >$1 million, completely goes against this. It only serves those who already have significant financial capital, whilst excluding your everday actual users. What do you think about how the ICO market has developed? Let us know in the comments below. Posted in NewsLeave a Comment on Are public ICOs coming to an end? What does it mean for the average investor?